The OrisaLifestyle Academy has created a spectacular, FOUR-PART SERIES of Master Classes and resource guides for you and your family. In it, you will enjoy a combination of videos, lectures and hands-on learning materials to help you plan activities and educational opportunities for people of all ages, at school or work, during family Holiday dinners, and in informal settings. These resources include materials especially designed to share with families with young children, teens and adults to enrich the Holiday experience with the truth and beauty of OrisaLifestyle. Ifa does not teach divisiveness. Ifa teaches unity and reconciliation. And so, we practice OrisaLifestyle so that we might have deeper, more meaningful relationships with the people who matter most. 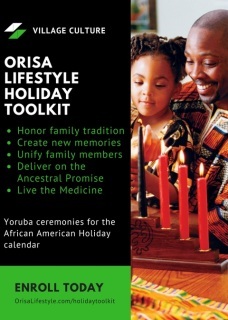 You don't have to choose between OrisaLifestyle and your family's existing traditions during the holiday season. You don't have to practice OrisaLifestyle as an afterthought. Each FULL DAY (6 hour) MASTER CLASS teaches you how to INTENTIONALLY infuse the mainstream American holidays with the ancestral consciousness of OrisaLifestyle. With the OrisaLifestyle Toolkit, you can honor your family's holiday traditions and practice OrisaLifestyle at the same time. the practical: How to talk about Orisa Ceremony with your family, how to set up the ceremonies, proven steps to delivering the ceremonies, even with people who have no exposure to OrisaLifestyle. the philosophical: Simple, but effective ways to explain the historical, psychological and therapeutic effects of OrisaLifestyle. the mystical: How to facilitate the esoteric experience of OrisaLifestyle.